Absoloot Value Accommodation (AVA) opened in June 2010 with a variety of accommodation options for the backpacker, flash-packer and value-seeking traveler! AVA has an outlook second-to-none and four stories worth of character and comfort. Absoloot Value Accommodation (AVA) has been designed with the backpacker, ‘flash packer’ and value-seeking traveler in mind. AVA is boutique backpackers in that we only have four and six bed dorms, and we have a maximum occupancy of 82. We provide free linen and towels for all guests, and every bathroom includes hair and body wash for everyone's use. Each room has been fitted with double glazing and shutters to keep the heat in and the noise out. And there's a heat pump/reverse-cycle air-conditioner in every room, so you can stay warm in winter and cool in summer. The beds are fitted with reading lights, and extra power points so you can charge your phone, laptop and ipod all at the same time if you wish! There's also a fridge in every room (except 6-bed dorms), so you can keep an eye on your personal food. And if you feel like chilling out at the end of the day and want to do your own thing, there's an LCD TV in every room (except 6-bed non-ensuite), so you don't always have to watch what everyone else wants to! The Lounge Room is now open 24hrs for those insomniacs, and it's equipped with a Nintendo Wii, XBox 360 and various board games to incite some healthy competition, and a 42 inch LCD television for movie evenings and major sporting events. We've even outfitted the room with 2 TV's so some can enjoy a movie while others play video games! There's also a well-equipped reading nook to keep the mind ticking. Our Guest Kitchen is now on the 2nd floor with multiple microwaves, ovens and stoves, and plenty of bench/eating space to enjoy your fine cuisine! With views looking out across Lake Wakatipu, you can start your day with a free hot chocolate, tea or coffee from our auto-urn, and prepare yourself for what Queenstown has in store. As close to a perfect hostel as I have encountered. Right in the centre of Queenstown. Everything is close by. The rooms are comfortable, with amazing facilities and helpful staff. I felt like Tom Hanks in Castaway, after coming in from hiking for a week. 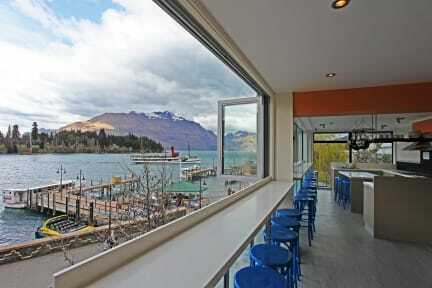 Would recommend to anyone who is looking for a hostel to stay in in Queenstown! Best location best location best location. Did I mention it was perfectly located? Everything was else was nice. Not knock your socks off amazing, but very nice and an incredible value for the price you pay. Keep rockin on you guys :) I’ll be back! Great location in the heart of the city. Clean rooms with a small bathroom and shower in the ensuite. Loved that there were chargers at all the beds. Compfy beds that don't move when you do. We've all been in a hostel like that and its appreciated they have solid bunk beds. Chill vibe and wasn't noisy during my stay. In a perfect spot of Queenstown. Big in such a good location does mean though it can be quite loud till 2/3am.. but if you’re out that late it won’t matter. Clean& tidy. Only downside was the kitchen being a bit small. But they use the space well and there is music which is nice! Rooms are fab and the reception is very chill! This hostel has an amazing view! From my room to the kitchen, the windows overlooked mountains and the lake. It’s an awesome view to wake up to. My room had an en-suite bathroom. It was a bit run down but cleaned daily by staff. No lockers for belongings in the room, just small ones for valuables only in the hall. Great, spacious kitchen. Beds and clean and comfortable. There is no real common area to meet people but the roommates I met there were great! Overall would stay again!! Overall great place. Rooms are quite small and air in the room is not changing that well. WIFI connection was c**p when I stayed Room was clean I didn't enjoy the atmosphere but that is more to the people I met than the hostel fault. Staff were friendly enough. I found hostel down the road to be better!!! !